One of the more significant libertarians on Planet Earth just now is Patrik Schumacher, whom I have mentioned here before, several times. Until recently Schumacher was the Number Two at Zaha Hadid Architects. But following the death of Zaha Hadid, he is now the Zaha Hadid Architects Number One. So, an important question for libertarians is: Can Zaha Hadid Architects keep going successfully, without Zaha Hadid herself, under Schumacher’s leadership? Given the dominant political attitudes within the architecture-and-design world these days, there are surely a lot of people now hoping that the answer will turn out to be: No. 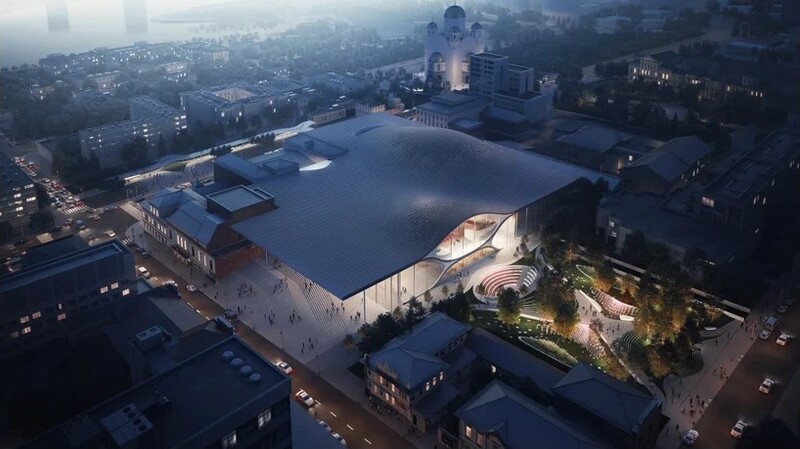 A report, complete with dramatic pretend-photos, that you can read and see here, courtesy of the Daily Mail, of a new concert hall that Zaha Hadid Architects will be building In Yekaterinburg, give cause for optimism. The point of this posting is that if Zaha Hadid Architects continues to thrive as it seems to be thriving now, that will be a win for libertarianism, because it will be such a very big personal win for Patrik Schumacher. Comment away all you like, of course – can’t stop you, wouldn’t want to. But whether you personally like the look of this new concert hall is beside my main point here. As the late Chris Tame used to say: we need our people everywhere, and architecture-and-design is an important somewhere. Schumacher reminds me of the late Peter Bauer. Bauer was in a minority of about one in the world of foreign aid, back when he was alive and arguing. Schumacher is likewise something of a lone voice in his world in an equally significant way. Where have I read about this all before? Engineers and tradesmen build things. Can’t tell you of the number of acoustics nightmares in (eg)”pretty” indoor, and outdoor, theaters in the US. But that’s OK, there’s a pretty good trade in “fixing” architecture that doesn’t work. I blame the invention of the slide rule, and subsequently, Computer Assisted Drafting/ Design. Personal favorite…Theater at Delphi (Greece). Seats are kinda’ hard though. But that one gives me doubts about the rest. I’ve been in the building several times and had to walk by it thousands. It is breath-takingly ugly and clearly designed to be a raised middle finger to the architecture around it. I like the text at that page which states that it “draws the city in” what I think they actually meant was “the city was taken in”. The only redeeming characteristic from my point of view is that it honestly represents the aesthetic value of most of the work displayed inside. I have spent most of my adult life working in “acoustic environments”. Most of them are typical architecture; designed from the outside in. Many of the exteriors could only be charitably described as “Stalinist Gothic” or “Frank LLoyd Wrong”. What kind of cretin designs a performance space in which the high, curved rear auditorium wall has a radius centered exactly on the usual location of the conductor or principal opera singer? Concert halls in the “classic shoe-box form where you can count six or more DISCREET slap echoes running from front to rear? What sort of ignorance drives the genii to design in PARALLEL side-wall sections, attendant with hideous standing waves and nasty flutter echos? And then compounds this with suspended timber paneling that has some seriously evil resonances. Not to pass by the timber-clad proscenium arches that resonate at different frequencies on either side, depending on the frequency and amplitude of excitation. And then you turn on the sound reinforcement / PA system and it all turns to crap. Hard-surfaced side-balcony “pods” form vertical standing waves and flutter between their lower surface and the hard timber floor below. Inadequate loading docks and poor equipment access, insufficient electrical distribution and capacity; it goes on and on without mercy. If I liked a single building which Zaha Hadid Architects ever designed, then I might bring myself to care. Surely the Bloody Stupid Johnson’s of our time.